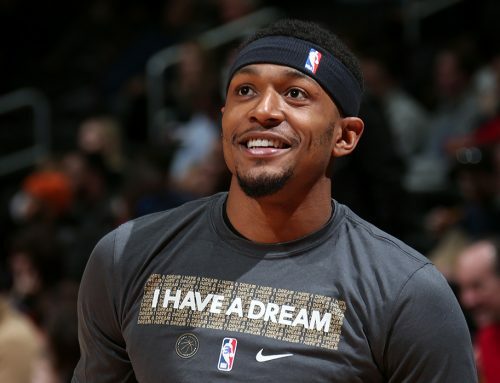 The 2017-18 season was a banner one for Washington Wizards guard Bradley Beal, headlined by his first All-Star appearance. Over the course of what was a breakout season for Brad were a slew of highlight performances. Before BB and his Wizards brethren get set to embark on a new season in D.C., we’re looking back on his top performances of his All-Star season. Brad’s second best performance of the 2017-18 campaign came in the first round of the playoffs against the Toronto Raptors. 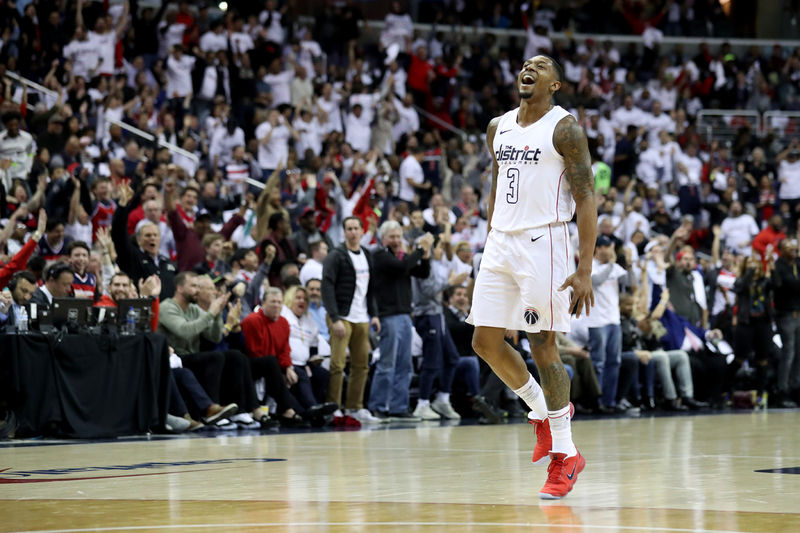 After Washington fell behind by double digits in the first half, the Panda got going in the second half, recording 20 of his 31 points in the final two frames to help the Wizards back into the game that evened the series at two games apiece. 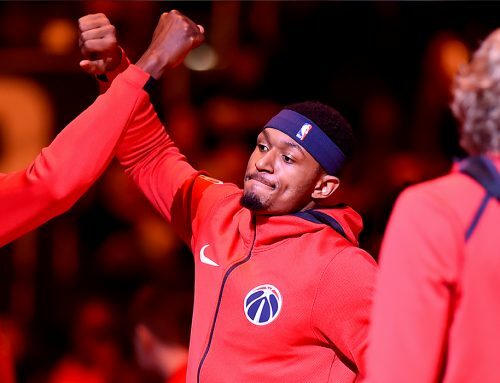 Bradley Beal didn’t get to play out the ending of the Wizards’ pivotal Game 4 with the Toronto Raptors, thanks to some questionable foul calls. But before he left, BB turned his game up a notch and gave the Wizards their best chance to even the series. Though he was forced to sit out the final five minutes after fouling out, BB made every minute he played count. No. 3 poured in a team-best 31 points on a remarkably efficient 10-of-19 from the field. That total included a 70 percent mark (5-of-7) from deep for the sharpshooter, who also grabbed five rebounds and dished out a pair of assists in the winning effort. His performance was highlighted by an epic third frame that saw him score 12 points on four big plays, nearly single-handily helping Washington erase an 11-point halftime deficit. He kept it going in the fourth, until he couldn’t anymore, forced from the game by a sixth foul call that left him steaming, and also nearly got him ejected. 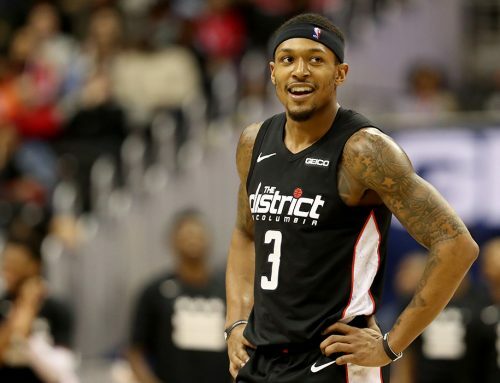 Although Beal was unable to play the final five minutes, his extremely efficient shooting night, sparked by his hot second half, got the Wizards back into the game. And after getting his team to the brink of victory with his dynamite second half, Brad had to put faith in his teammates and became their No. 1 fan as they closed out a series-tying victory. The 2018 postseason did not get off to the start the Washington Wizards had hoped for, as they dropped the first two games of their first-round series to top-seeded Toronto. 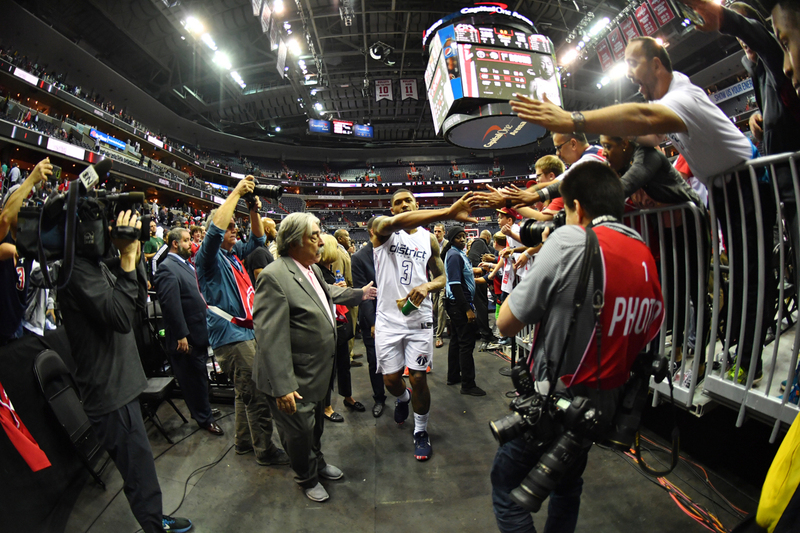 But when the series headed to D.C. for Games 3 and 4, the Wizards flipped the switch. 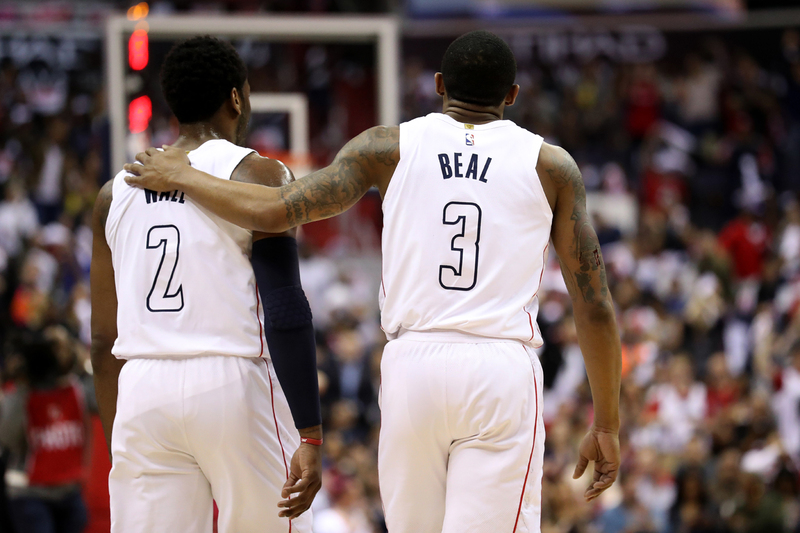 The Wizards returned to Capital One Arena needing to win both games on their home court to even the series and got off to a great start in that regard in Game 3 with a 19-point win, highlighted by solid all-around performances from backcourt brothers Bradley Beal and John Wall, who tallied 28 points each. However, the Wizards didn’t carry that momentum into the start of Game 4. Toronto came out hot, jumping out to an early double-digit lead. The Raptors led by eight after one, despite nine points from BB in the opening frame. Both defenses locked down in the second, but the Raptors were just a bit better, keeping Brad in check while pushing their lead to 11 at the break. Coincidentally, he kicked it off by drawing a foul on a three-point attempt, that sent him to the line where he knocked down all three attempts to pull the Wiz within seven. Moments later, BB grabbed a rebound, took the ball up, stepped into and buried a trey on the other end and within an instant, Washington was back within four. His next trey came near the midway mark of the third and pulled D.C. within one, but it was his third three of the third that put the Wizards in front for the first time. 66-65 with 5:27 to go in the third. The game went to the fourth quarter tied at 80, but after giving up eight consecutive points to start the final frame, the Wizards found themselves in a hole again. Thankfully, BB caught fire again, scoring eight of Washington’s next 10 points to tie the game up at 90 as the game drew near a conclusion. However, with the game tied at 92 with 4:58 remaining on the clock, No. 3 was called for his sixth foul against DeMar DeRozan, and was forced to watch the remainder of the game from the bench. But BB wasn’t simply a casual observer. He was there in the huddle, offering encouragement and instruction, rallying his team as a leader despite being reduced to cheerleader for the home stretch as some great play from Wall helped secure the victory. Unfortunately, for Brad, Wall and the Wizards, Game 4 marked their final victory of the 2017-18 campaign. They fought valiantly but lost Game 5 in Toronto by 10, then couldn’t keep the series alive when it returned to Washington. falling 102-92 despite a series-high 32 from No. 3 in Game 6. That loss ended a disappointing campign in D.C. but providing supreme motivation for the season to come.